I searched for this and old threads from 2014/2015 suggest that it has already been implemented, but I can’t for the life of me work out how to do it. Labels for read / unread / action needed etc. It would be nice to be able to quickly grab the papers in my database that have no filters, especially if I add a bunch I want to add ‘unread’ to them as a batch. 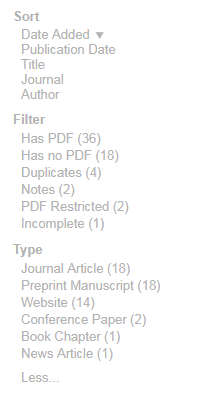 Use the “Unsorted” filter, to the right of the list of papers. Oh wait - its because I was filtering by folder already - it has appeared now I’m seeing all papers. Unsorted means without a label or a folder. It only shows up if there are papers in the current view which are unsorted. Ok - thanks, so if something is already in a folder it won’t get picked up by this filter - label or unlabelled? Of course I can remove everything from my folders but would it not be better to seperate ‘unsorted’ into ‘unlabelled’ and ‘unfoldered’? I’d be interested to know what the suggested workflow would be given the ‘unsorted’ button.